Army is the third film in the Evil Dead series but was the first one I ever saw. Frankly, I don't think that affected my enjoyment of Army, and such a bizarre way to view the movies seemed appropriate given the wacky universe we find here. Army finds Ash (Bruce Campbell), the protagonist of the prior two films, sent back to medieval times where he needs to fight the "Deadites", a variety of zombie-like critters who've haunted him for some time. Army of Darkness appears in an aspect ratio of approximately 1.85:1 on this Blu-ray Disc. This wasn’t a great image but it mostly satisfied. Sharpness was usually fine, as much of the flick showed good definition. A few soft elements occurred, some of which made sense due to all the complicated visual effects. Others seemed perplexing, such as the shot from the perspective of “the pit”. Anyway, overall delineation remained positive. I noticed no issues with jaggies or shimmering, and edge haloes weren’t an issue. Outside of some dirt/scratches from the original negative, print flaws seemed minor. I saw a few specks and blotches but most of the film looked clean. Colors seemed good. The movie tended toward a natural look, with a somewhat amber feel. The tones looked well-rendered, if not impressive. Blacks looked fairly dark, and shadows were acceptable. Some low-light images were a bit thick, but most appeared appropriate. This was a generally high-quality presentation. I felt pleased with the DTS-HD MA 5.1 soundtrack of Army. It presented a nice soundstage for the most part, with a great deal of activity that spread neatly across all three of the front channels. Sounds seemed well-placed within that realm and panned across the speakers smoothly. The surrounds kicked in quite a lot of information as well and seemed active; they added a strong dimension to the mix. How did this 2015 “Collector’s Edition” Blu-Ray compare with the 2009 Screwhead Edition Blu-ray? Audio seemed virtually identical, as I didn’t discern any obvious differences between the DTS-HD MA 5.1 tracks on the two discs. Visuals were a different story, one that favored the 2015 Blu-ray. While a little dirtier, it seemed better-defined, mainly because it lost the edge haloes that showed up on the 2009 Blu-ray. I also thought blacks and shadows were a bit stronger. The 2015 release wasn’t a revelation, but it demonstrated improvements. Packed with extras, this three-disc “Collector’s Edition” spawns four different versions of the film. In addition to the Theatrical Cut (1:20:47), we find the Director’s Cut (1:36:23), the International Cut (1:28:48) and a Television Version (1:33:03). Note that my picture/audio ratings solely addressed the theatrical cut. I sampled the others and found that the Director’s Cut offered reasonably comparable quality. It showed weaker visuals, mainly in the shots added for the longer version, but it never fell off a cliff. While it wasn’t as attractive as the theatrical cut, it still looked good. The “International Cut” maintains a similar level of quality, but the “TV version” does not. Also the only edition of the film here without DTS-HD MA 5.1 audio, the “TV Version” offers Dolby Digital 2.0 sound and bland visuals. It also comes with an oddly choppy feel, as though the frame rate goes a little haywire. It’s the least appealing presentation of the four. As for the differences among the various versions, that’s a subject that could take a long time to explain. For those interested in the variations, I suggest a trip to IMDB – that site’s “Alternate Versions” area will give you a good account of the various changes. I can tell you which rendition I prefer: the “Director’s Cut”. I think it works far better than the others, mainly because it extends the climactic battle by a significant amount; of the 15 minutes added to it, about two-thirds of that time comes from more material with the wacky skeletal warriors, and I love that stuff. I’m glad to have so many viewing options, but I’ll always stick with the “Director’s Cut”. Disc One offers the Theatrical Cut and other features. A new documentary called Medieval Times runs one hour, 36 minutes, 35 seconds and offers notes from special makeup/creature effects creators Robert Kurtzman, Greg Nicotero and Howard Berger, mechanical effects artist Gary Jones, 1st AD John Cameron, stunts/actor Patricia Tallman, production designer Anthony Tremblay, director of photography Bill Pope, costume designer Ida Gearon, visual effects supervisor William Mesa, foam fabricator/actor William Bryan, editor Bob Murawski, stunt coordinator Chris Doyle, composer Joseph Lo Duca, and actors Bruce Campbell, Marcus Gilbert, Ricky Grove, Tim Quill, Ted Raimi, Bill Moseley, and Angela Featherstone. “Medieval” examines the project’s roots and development, cast and performances, the movie’s tone and influences, props, costumes, makeup and effects, Sam Raimi’s directorial style, sets and locations, stunts/action, editing and changes for various versions, music, MPAA issues and its release/legacy. On the negative side, the absence of director Sam Raimi becomes a disappointment. Still, even without Sam, “Medieval” delivers a fun look at the movie. It covers a solid array of topics and includes lots of good behind the scenes elements. This means it adds up to an enjoyable and informative documentary. A mix of cut footage appears here. Also found on the prior Blu-ray, the Original Ending goes for four minutes, 37 seconds and shows a different method used to get Ash back to the present day – as well as a very different scene when he arrives. It’s an interesting variation. In addition to an Alternate Opening (2:58), we get three Deleted Scenes (11:06). The “Opening” gives us added monologue from Ash as part of the introductory exposition, so it doesn’t differ much from the actual start to the film. As for the “Deleted Scenes”, we see more of Ash soon after he arrives in the 14th century and battles Lord Arthur. We also get a longer sequence with Ash in the creepy windmill, and Ash’s attempt to recruit Henry for the climactic battle. None of these seem especially interesting – and the windmill segment seems to go on forever. The “Alternate Opening” and the “Deleted Scenes” can be viewed with or without optional commentary from Sam Raimi and Bruce Campbell. They tell us a little about the segments as well as why the clips didn’t make the final cut. They remain chatty but they don’t give us a ton of concrete information. Disc One finishes with ads. We get the movie’s theatrical trailer, its US video promo and four TV spots. Alongside Disc Two’s Director’s Cut, we locate an audio commentary with writer/director Sam Raimi, writer Ivan Raimi and actor Bruce Campbell. Recorded for the Director’s Cut’s original 1999 DVD release, Campbell and Sam Raimi sit together for a running, screen-specific chat; Ivan Raimi joins them about halfway into the movie. The track looks at story/characters and changes for this version of the film, cast/performances, sets and locations, effects, makeup and costumes, music, and related areas. While mostly enjoyable, the commentary can drag a little too much for my liking, mainly because it sometimes becomes little more than a discussion of what those involved do/don’t like about the film. Still, Sam Raimi and Campbell interact in a fun way, and we get a fair amount of good info about the film. Even if a lot of that material already shows up in the documentary, the commentary entertains enough to become worth a listen. A compilation of On-Set Video Footage lasts four minutes, 40 seconds. It shows raw footage from the shoot and becomes a nice compilation. Also found on the prior Blu-ray, Creating the Deadites goes for 21 minutes, 29 seconds and provides notes from and Berger. They discuss all the techniques used to bring the fantastic elements of Army to life. We also see a lot of archival footage in this tight, informative show. A featurette called Behind the Scenes Footage from KNB Effects fills 53 minutes, 54 seconds. It offers exactly what its title implies: lots and lots of shots that let us see KNB’s work on the film. I enjoy this form of raw footage and this turns into a fun look at the shoot. Next we locate a Vintage “Making Of” Featurette. From 1993, this four-minute, 51-second piece offers notes from Sam Raimi, Bruce Campbell, and producer Rob Tapert. They offer a basic character/story recap in this forgettable puff piece. Disc Two ends with Extended Interview Clips. This five-minute, two-second package provides circa 1993 notes from Sam Raimi, Bruce Campbell, and Rob Tapert. They expand on the topics found in the 1993 featurette. A few minor tidbits emerge, but the clips lack much substance. In addition to the aforementioned International and Television Cuts of the film, Disc Three provides an International Trailer and still galleries. One gallery offers a mix of photos, drawings, and documents (337 images), while the other focuses on props, effects and costumes (47). Both offer valuable glimpses of the production. Storyboards offers 54 screens of art and information. This area concentrates on scenes altered for the actual shoot, which makes the imagery more compelling. Disc Three ends with a featurette called The Men Behind the Army. Narrated by Bruce Campbell, it goes for 18 minutes, 58 seconds and includes notes from Howard Berger, Greg Nicotero and Bob Kurtzman. As implied by that crew, “Behind” gives us another look at what KNB did for the film. It turns into another interesting view of the effects. 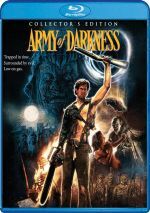 A rare sequel that betters the original film, Army of Darkness offers a wild ride that never lets up and that continually entertains. It’s campy action/horror, but it’s delightful nonetheless. The Blu-ray offers generally good picture and audio along with a terrific set of supplements. This becomes the definitive release of an enjoyable film.